The information below is from the book In God We Still Trust by Dr. Richard G. Lee. A general dissolution of principles and manners will more surely overthrow the liberties of America than the whole force of the common enemy. While the people are virtuous they cannot be subdued; but when once they lose their virtue, they will be ready to surrender their liberties to the first external or internal invader. How necessary then is it for those who are determined to transmit the blessings of liberty as a fair inheritance to posterity, to associate on public principles in support of public virtue. Until public virtue again becomes part of our culture, there is little hope for our future. I don’t know about you, but the bottom map looks much more logical than the top map. I am sure I could have found many other examples, but this is one I know. Note the lavender that meanders from the Rhode Island border up to near Boston. I suppose it is simply an incredible coincidence that the lower part of that lavender is less populated than the area approaching Boston. Also, much of the lower part of that lavender tends to be Republican. What better way to dilute those votes than combine them with the more densely populated Democrat areas approaching Boston. 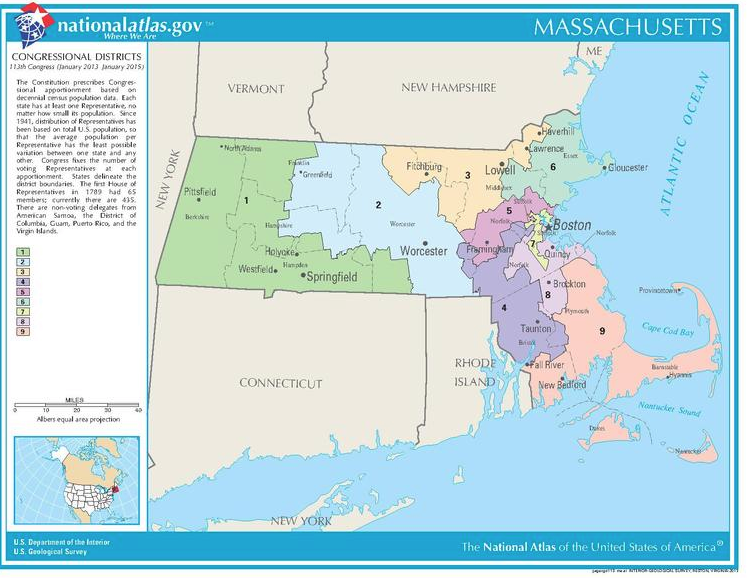 Massachusetts is a one-party state, and its Congressional districts have never been challenged in court. Hmmm. At any rate, the courts threw a monkey wrench into North Carolina’s November election. It is too late to change the districts, undo the primary elections, and print the ballots. It appears that saner heads have prevailed and the districts will remain in place at least until November. 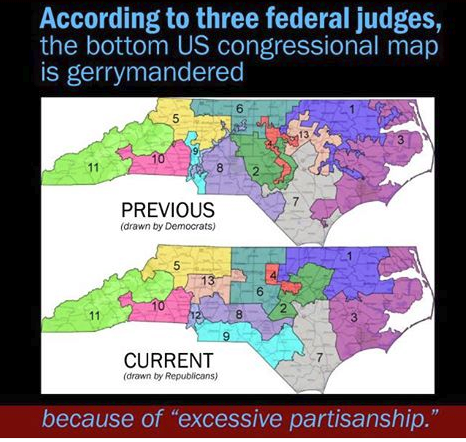 The plaintiffs who persuaded federal judges to declare unconstitutional North Carolina’s Republican-drawn congressional maps have “reluctantly concluded” that there is not enough time to draw new maps in time for the November elections. A three-judge panel ruled this week that the maps were an “invidious” plan to favor Republicans over Democrats and had resulted in the GOP capturing 10 of the state’s 13 congressional districts in 2016, even though its share of the statewide vote was just over 53 percent. There is a reason we live in a representative republic and not a democracy. I think the redrawn districts appear to be much more logical than the previous districts. I lived in Massachusetts for a long time. Ted Kennedy was my Senator. There didn’t seem to be anything I could do about that. He was known to be a womanizer who did not always have the best interests of America in mind. At one point he wrote a letter to a Russian leader asking for help in making sure Ronald Reagan did not get elected. He also had addiction problems and was not noted for telling the truth. Nevertheless, he continued to get elected. I don’t know if the people of Massachusetts didn’t realize the kind of person he was or if they didn’t care. At any rate, the truth about Ted Kennedy is now coming out. Yesterday The National Review posted an article about the movie “Chappaquiddick.” The movie deals with the events on Martha’s Vineyard the night Mary Jo Kopechne was killed. The movie is an honest portrayal (as honest as possible considering we really don’t know exactly what the chain of events was) of the events of July 18, 1969. And so we had Ted Kennedy in the Senate from 1962 until 2009 doing untold damage to the country and to the U.S. Constitution. Yesterday The Daily Signal posted an article about five Republican Congressmen who have asked Attorney General Jeff Sessions to end Operation Choke Point. The program works by using federal banking regulators to pressure banks out of doing business with entire industries the government declares to be “high risk,” choking their access to the U.S. banking system. But instead of simply targeting illegal, fraudulent businesses, the program also affected legal business owners, who complained they were being unfairly denied credit and losing access to third-party payment processors central to running their businesses. Over the past two years, The Daily Signal documented multiple cases of banks’ denying legal business owners access to banking services. I reported in June of 2014 (here) that Mark Cohen, owner of Powderhorn Outfillters, a store in Hyannis, Massachusetts, that sells guns was denied a loan by TD bank because of the fact the he sold guns. That is only one example of how Operation Choke Point was used to interfere with honest businessmen trying to earn a living. Payday lenders were also targeted by Operation Choke Point, and Community Financial Services Association of America, which represents some of the nation’s largest short-term lenders, such as Advance America, filed a lawsuit. The suit named the Federal Deposit Insurance Corp. (FDIC), the government agency responsible for creating a “high risk list” of industries to target. That list grouped categories such as “racist materials” and “credit card schemes” with “firearms” and “tobacco” sales. In July, the U.S. District Court for the District of Columbia ruled that payday lenders may press forward with their lawsuit against the FDIC and begin the discovery phase. That phase allows the plaintiffs to depose government officials under oath and examine documents and emails related to the program. In April 2016, one of President Barack Obama’s top Justice Department officials behind Operation Choke Point admitted the program had “unintended but collateral consequences” on banks and consumers. No kidding. Actually, I am not convinced the consequences were unintended. Yesterday I posted an article about the State of Connecticut‘s attempt to make gun ownership very expensive. Well, the Commonwealth of Massachusetts has come up with its own idea of how to make using your gun very expensive. A gun bill in Massachusetts is looking to expand gun restrictions in the state through additional taxes on lawful gun owners. The legislation, sponsored by Democratic state Sen. Cynthia Creem, is one of many she said she has filed every state senate session in order to “to make it harder and harder” to obtain a gun, she told Wicked Local Newsbank. Not only would the bill impose a 4.75 percent surcharge “on sales at retail of all ammunition, rifles, shotguns, firearms or parts thereof” on top of the licensing fees, the state’s 6.25 percent sales tax and the 11 percent federal excise tax; it would also require virtually all firearm sales to take place through a licensed dealer, with an additional charge for private gun sales, require gun owners to use fingerprint scanners to deactivate the weapon when the technology becomes available and bans .50 caliber weapons outright with a hefty fine and possible jail time if someone is found in violation of the law. The money raised by this scheme would go into the Firearms Violence Prevention Trust Fund, which the bill establishes. Wow! Penalize gun owners to create more bureaucracy! Gun activists in the state are outraged by the sweeping legislation, especially since research shows that crime rates either are not affected or increase over time with more gun restrictions, according to the Crime Research Prevention Center. Frustration with the legislation also includes the belief that lawful gun owners seem to be punished for the transgressions of criminals, people who would find an illegal way to obtain a gun no matter what the law says. Okay. Let’s look at this a minute. When law-abiding citizens cannot afford guns because the State Legislature has made it very expensive to buy or own one, do you think criminals will still have guns? This is Massachusetts’ attempt at an end run around the Second Amendment. The way our government was set up, the states have the right to disregard a law that is made that does not comply with the U.S. Constitution, but what do you do when the state itself is attempting to undermine a freedom guaranteed by the U.S. Constitution? On August 3, the Massachusetts newspaper South Coast Today posted an article about changes in fish stock surveys. In what one advocate called “a potential sea change” for the commercial fishing industry, NOAA Fisheries announced intentions Tuesday to shift all or part of long-controversial stock surveys from its Bigelow research vessel to commercial boats, saying a transition over the next five years could bring “greater shared confidence” in survey results. “We have to learn to work better with the (commercial fishing) industry — we have to open up better lines of communication,” Dr. Bill Karp, director of NOAA’s Northeast Fisheries Science Center in Woods Hole, said of the transition. How fish stocks are measured has been one of the biggest points of contention for years between governmental regulators and commercial fishermen, as survey results affect seasonal catch limits, quotas for various species and more. The latest questions about NOAA’s Henry R. Bigelow research ship arose this spring, for example, when maintenance problems delayed NOAA’s spring survey from April to June. Don Cuddy, program director for the Center for Sustainable Fisheries in New Bedford, said fishermen also have felt the Bigelow is unable to accurately count “flatfish,” such as yellowtail flounder, because of the type of gear it tows. The bottom line here is very simple–the commercial fishermen know a whole lot more about the fish population than the government does. Most commercial fishermen have spent their entire lives fishing and understand things the government has not even considered. Most commercial fishermen are conscious of the environment because they realize that if they overfish a certain type of fish, they lose their livelihood. Life was better all the way around before the government began to attempt to take control of the commercial fishing industry. All they are succeeding in doing is putting small family fishing boats out of business, and those family fishing boats are the conscientious fisherman who do not overfish. The conscientious fishermen know how to catch specific fish and how to measure specific fish populations–the government does not. WCVB in Boston reported yesterday that the Massachusetts Supreme Judicial Court ruled Friday that saying the pledge of allegiance every day in public school, including the words “under God,” does not violate the Massachusetts Constitution or discriminate against atheists. In 2010 an atheist family in Acton, Massachusetts, sued, claiming that the daily recitation of the pledge in classrooms violated their three children’s constitutional rights. The family, who are not identified in the suit, said the ruling insinuates that nonbelievers are less patriotic. The decision only applies to Massachusetts because the pledge’s language is defined by federal law.